We are known for having the best slogan t-shirts. We stand for a powerful female attitude to empower women all around the globe. 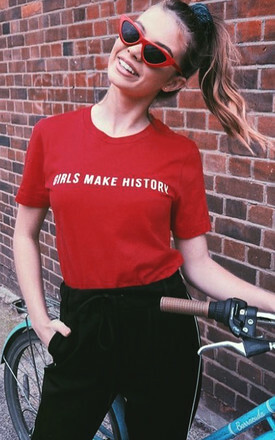 This girl power top is so true and is happening each day. One day we will be truly equal. - Sophia is wearing a small and she usually wears a dress size 8 and is 5ft 5". - Perfect for rioting, breaking rules and sipping cocktails.